Swing Band London-Mississippi Swing hanging out before a performance. 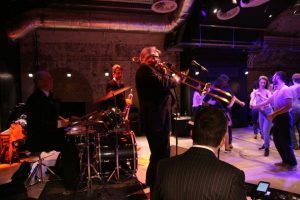 Do you want to hire a Swing Band in London? We think we have one of the best (well we would wouldn’t we?) Mississippi Swing have been swinging London for 20 years; and in that time have played all the best London Hotels, played all the best London Music venues, helped London brides and grooms celebrate weddings and have created the ambience and hospitality backdrop for countless corporate events in London. Lets get straight to it. Here is Mississippi Swing in a promo video playing some fabulous Rat Pack Classics, some Swing Band classics and even something from one of the new guys! If you are organising some corporate hospitality and want music, call us. We totally understand the responsibility of representing your brand. You can trust us. Just like BP have done so in the past, as JP Morgan have, as The London Evening Standard have, as Threedneedle Asset Management have. We could go on and on. Beautifully turned out, arriving in plenty of time, fully briefed and so cooperative. We want your event to be as successful as you do and we will do everything we can to make it so. If you want to discuss your event feel free to call Jeff Williams on 020 8761 8932 or 07747 801471. More contact details are here where you can email for a quote and we can send some information direct. Book a Swing Band in London! 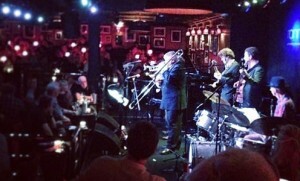 Swing Band London-Ronnie Scott’s Sold Out! Try before you buy. Why not come and see us play? 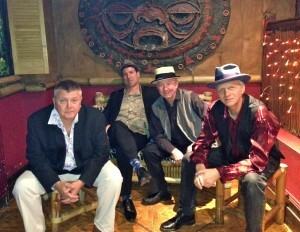 We are regular performers on the London Swing and Jazz Scene. We work at Ronnie’s, Boisdales, the Bulls Head in Barnes. 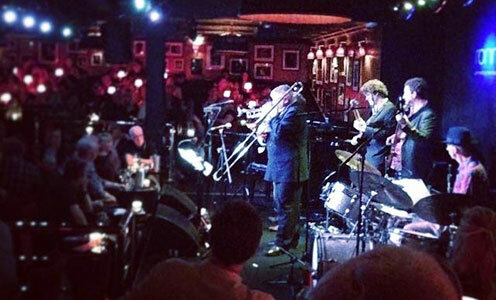 All great London venues perfect to check out our swing band. Here is our performance page where you can see where and when we are playing. Phone us up, if we can invite you and a friend along as a guest, we will! Acoustic Option. Want the band to play for an outdoor event? Worried that there is no power? No problem. This London Swing Band has a brilliant acoustic, unplugged option! 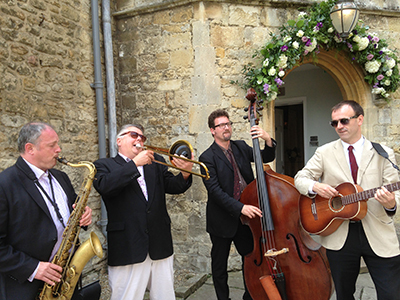 As trombone/vocals, sax, bass and guitar, the band has played countless acoustic gigs for Flower Shows, Wedding Receptions, Business Events, Store Promotions and Garden Parties. Want to learn to dance to a swing band in London? this is the website for you!! Swing Band Hire. We love playing for dancers. Here is a picture of the band working with an excellent organisation Swing Patrol. These guys put on some sensational events around the London area. A great place to meet people, a great place to get fit and a fabulous place to hear some amazing music. For a London Swing Dance or a Lindy Hop Night contact us here for what we can offer you and what we charge for our services. Our fees are keen. Most people charge for a six piece band, we can make the same sound with four!